Canelo Alvarez’s most recent fight was at T-Mobile Arena in Las Vegas, when he knocked out Amir Khan in the sixth round on May 7 before 16,540. But Alvarez’s next bout will be back in Texas, where twice over the past three-plus years he has fought before huge crowds. Alvarez (47-1-1, 13 KOs) on Sept. 17 will challenge Liam Smith (23-0-1, 13 KOs) of Great Britain for his junior middleweight belt at AT&T Stadium in Arlington (on HBO pay-per-view). Alvarez in May 2015 knocked out James Kirkland in the third round at Minute Maid Park in Houston. Alvarez in April 2013 won a 12-round decision over Austin Trout at the Alamodome in San Antonio. It was therefore no surprise that this bout landed back in the Lone Star State. “After Canelo knocked out James Kirkland in Houston last year, he was clear that he wanted to come to Texas at least once a year from then on out,” said Oscar De La Hoya, Alvarez’s promoter. “Canelo drew more than 33,000 people (actually, 31,588) in Houston after drawing more than 45,000 (more like 40,000) in San Antonio for his fight with Austin Trout. AT&T Stadium was previously known as Cowboys Stadium and is home to the Dallas Cowboys, owned by Jones. Vyacheslav Shabranskyy of Ukraine is trying to follow in the footsteps of other boxers from his country by winning a world title. He could be on his way, what with a record of 16-0 and 13 knockouts as a light heavyweight. He’s ranked as high as No. 5 in the world by one organization. Shabranskyy goes by the moniker “Lion Heart.” His promoter, Oscar De La Hoya, believes it fits. Shabranskyy on Aug. 19 will continue his journey when he takes on Oscar Riojas (10-5-1, 3 KOs) of Mexico in a stay-busy fight at Belasco Theater in Los Angeles (on Estrella TV). When undefeated Antonio Orozco enters his July 30 fight against Tijuana’s Abner Lopez at Fantasy Springs Casino in Indio, in Orozco’s back pocket will be a newly signed multi-year contract extension with Golden Boy Promotions. The accord was reached this week. Orozco, 28, is 24-0 with 16 knockouts and is ranked No. 1 at junior welterweight by one governing body; he’s in the top 10 of the other three. De La Hoya speaks highly of him. “Antonio Orozco is one of the best fighters in our stable at Golden Boy Promotions, and with his natural talent, skill and strong work ethic, he is poised to become a world champion in this sport, without a doubt,” De La Hoya said. Orozco-Lopez will be televised by HBO Latino. Remember when it was announced recently that Golden Boy Promotions and K2 Promotions agreed that Gennady Golovkin and Saul “Canelo” Alvarez will fight each other in September 2017? It was a handshake accord. Golovkin’s trainer, Abel Sanchez, does. Guess which one Sanchez believes will come to fruition? Based on Alvarez giving up his WBC middleweight belt rather than fight Golovkin this year, that’s an easy answer. “Let me tell you this: Supposedly, there was a handshake agreement between Bob Arum and (K2’s) Tom (Loeffler) for a Ramirez fight, and a handshake agreement – supposedly, according to Oscar (De La Hoya of Golden Boy) – for the ‘Canelo’ fight for September of 2017,” Sanchez said by phone Tuesday. “I would venture to say that I’d be more likely to believe there’s a handshake agreement with Bob Arum than there is for the ‘Canelo’ fight. One can’t blame Sanchez for not being a believer in the handshake agreement for Golovkin-Alvarez. It was Alvarez who called out Golovkin after Alvarez knocked out Amir Khan in May at T-Mobile Arena in Las Vegas. Alvarez said he would fight Golovkin, who was there, right then and that he would do it at 160 pounds. Previously, Alvarez and Golden Boy – which promotes Alvarez – had said a fight with Golovkin would have to be at a catch-weight of 155 pounds. Then Alvarez gave up his belt rather than adhere to a deadline set by the WBC for the ordered fight with Golovkin. Then came the news that there would be no Golovkin-Alvarez fight for well over another year. Amateur bouts between L.A. and NYC cops highlight Golden Boy card in L.A.
Oscar Negrete (14-0, 5 KOs) of Los Angeles will take on Jose Bustos (11-6-3, 7 KOs) of Mexico in the bantamweight main event Friday night at Belasco Theater in Los Angeles (on Estrella TV). But there will be something of bigger importance taking place as well when cops from L.A. will take on cops from New York City in a total of seven amateur bouts ahead of the three pro bouts on the card. A portion of the proceeds will benefit the Susan G. Komen Foundation, which is geared toward eliminating breast cancer. Former middleweight champion Saul “Canelo” Alvarez of Mexico will move back down in weight and challenge Liam Smith for his junior middleweight title on Sept. 17, Golden Boy Promotions announced Friday. The venue is not yet confirmed, but it could be MGM Grand in Las Vegas. The bout will be televised on HBO pay-per-view. Golden Boy and K2 Promotions – which promotes middleweight champion Gennady Golovkin – met this week in Los Angeles and out of that came the news that a bout between Alvarez and Golovkin will not take place until September 2017 at the earliest. Golovkin would fight Alvarez this September, but Golden Boy does not want that. Instead, we’re getting Alvarez-Smith. Smith, of England, is 23-0-1 with 13 knockouts. He has never fought anyone near the caliber of Alvarez (47-1-1, 33 KOs). But Golden Boy and Alvarez are going to play it off like Smith is a real mean hombre. Oscar De La Hoya, president of Golden Boy, also played up this fight as a certain barnburner. “This fight will be a slugfest between two heavy hitters, and I have little doubt that it will end with a 10-count,” he said. Smith has stopped his past eight opponents inside the distance, and that is something we’re going to hear a lot about from Golden Boy. But the eight victims are anything but household names. One thing’s for sure, this is a terrific chance for Smith, though it’s unlikely he’ll be able to take advantage of it. “This fight allows me to make my name in the U.S. and show just how good I am and this is the big stage that will enable me to do that,” Smith said. OK, so promoters Oscar De La Hoya and Tom Loeffler apparently met at De La Hoya’s Golden Boy Promotions offices in Los Angeles on Wednesday to talk about a fight between middleweight champion Gennady Golovkin and former middleweight champion Saul “Canelo” Alvarez, according to several publications. It’s no secret that the boxing world was hopeful that fight would happen this September. But Alvarez recently vacated his WBC title rather than sign to fight Golovkin under the duress of a deadline set forth by the WBC. Well, the only thing that apparently came out of Wednesday’s meeting was that the sides verbally agreed to make the fight – in September 2017. That means virtually nothing because there is no contract. And this is boxing, where so much can happen in 15 months. Before everyone who so badly wants to see this fight goes off the deep end in celebration, chill out. Golovkin is likely still going to be a monster in 15 months, and we’re not sure De La Hoya will ever want Alvarez to tangle with him. Golovkin, of course, would have happily fought Alvarez this September. It’s De La Hoya, Alvarez’s promoter, who seems reluctant to put his man into a fight with the beastly Golovkin at this point in time. We’re going to hear how De La Hoya wants this fight to marinate and how this extra time will allow Alvarez to mature into a full-fledged 160-pound middleweight, instead of one that toils at a catch-weight of 155. If this fight happens at some point, terrific. But as a story on Yahoo.com points out, Loeffler – Golovkin’s promoter – said nothing has been signed. So there is really nothing to celebrate. The feeling here is, we’ll believe it when we see it. Many in boxing are hopeful that Saul “Canelo” Alvarez of Mexico will take on fellow middleweight champion Gennady Golovkin sometime this year in a title-unification bout. 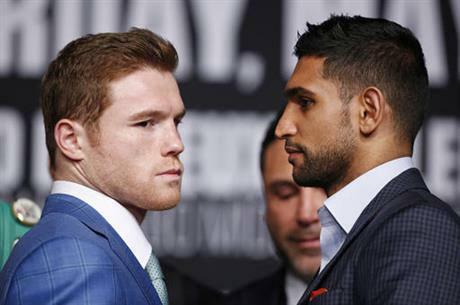 Meantime, Alvarez will make the first defense of his championship belt when he tangles with Amir Khan of England on May 7, most likely at T-Mobile Arena in Las Vegas. The arena is under construction and expected to be finished in time to host the bout, which will be shown on HBO pay-per-view. The middleweight limit is 160 pounds, but the fight will be contested at a catch-weight of 155. Khan has never fought above welterweight, which is 147 pounds. Khan (31-3, 19 KOs) won a super lightweight world title in July 2009 and added another belt to that when he beat Zab Judah in a title-unification fight in July 2011. Khan moved up to welterweight in April 2013 and has had four fights at that weight. The fighters are going to say every positive thing they can to promote this fight. It’s boxing, and that’s what they do. But it will be interesting to see how this bout is received by fans who know only too well that there is nothing dangerous about it for Alvarez, who is the larger fighter and won’t have to worry much about being knocked out by a fighter who was a 135-pound lightweight until 2009. But Khan does have a name in the sport, and he is an exciting fighter to behold. Oscar De La Hoya will promote this fight under his Golden Boy Promotions banner. He is pumping this as Alvarez (46-1-1, 32 KOs) taking on the “best” the sweet science has to offer. “We are committed to putting on the biggest and best fights in boxing,” De La Hoya said. “‘Canelo’ is the biggest star in the sport and as he demonstrated against James Kirkland and Miguel Cotto last year, he is only getting better. Alvarez knocked out Kirkland in the third round this past May in Houston and then won his middleweight title when he took a unanimous decision over Cotto in November in Las Vegas. De La Hoya, who has brought boxing back to Downtown L.A. with Golden Boy Promotions’ L.A. Fight Club, added that boxing fans want to see Pacquiao win Saturday’s fight. See more of what De La Hoya had to say in the video below, also check out more of his interview in this column by the L.A. Daily News’ Mark Whicker. Julian “El Camaron” Ramirez of Los Angeles is now 14-0 after winning a lopsided unanimous decision over Raul Hidalgo of Mexico in the 10-round featherweight main event Thursday at Belasco Theater in Los Angeles. The card was part of Oscar De La Hoya’s L.A. Fight Club series. Ramirez, just 22, won by three scores of 100-90 as Hidalgo (23-13) did not win a round. Ramirez did good work both to the head and body.